Some traditional healers, Islamic clerics and Christian pastors, who claim to have the cure for mental disorders, often leave mental patients to suffer under very barbaric and inhuman conditions. Investigations into psychiatric illness and its attendant worries of treatment has revealed a plethora of degrading human conditions in a number of traditional and religious healing centres in Ghana, Burkina Faso and South Africa. Chains and whips are part of the medications used to cow a militant psychiatric patient into docility in some of such facilities. “I collapsed out of hunger and pain when I was taken to a prayer camp in Cape Coast and to my surprise, my pain was immediately interpreted as a miracle by that fake pastor attracting thunderous applause amidst the shouting of ‘God is great’ from the congregation,” Felicia Katehena who suffered temporal mental challenges told the paper in an interview. “The Mallam always wins in this case but to us, the mental patient in search of a cure, it is a life of pure isolation in shackles, physical abuse, denial of food and forced medication” Ibrahim Hamisu who was shackled to a pole in Nagrengo, a town in Burkina Faso said in an interview. 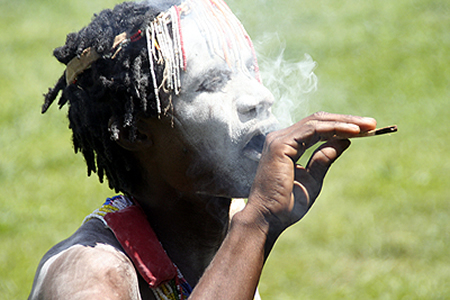 The investigations also revealed that some traditional healers were just fleecing off cash from families of psychiatric patients in the name of offering non-existent healing. The New Crusading Guide’s reporter moved into the above mentioned countries in search of a cure for mental disorder and witnessed first-hand various scenes of chicanery and massive deception in the name of the Good Lord. On an outstretched bamboo mat, Madam Nyalungu throws her assorted deities made up of dry bones, cowries, animal skin and other accoutrements and gazes at them speculatively and screams… “you are a mad man of no mean a piety and the gods have confirmed it, you have been bewitched, a relative of yours has planted a dark spirit in your head, there is no cure for this in any hospital in this world, only the ancestors can cure it through me Nyalungu”, she said with her spiritual stick firmly pointed at the reporter who had been rushed to her shrine as a mad man searching for cure. The result was a painful barbaric healing process lasting over two hours that left the reporter rather sick of terrible headaches, uncontrollable coughs and chest pains. Johanna Nyalungu is a renowned (sangooma) traditional divine healer and soothsayer at Motsoaledi Squatter Camp, Diepkloof, a suburb of South-West Township (Soweto), South Africa. Motsoaledi is a poverty endemic settlement built with corrugated metal sheets, plastic wraps and scraps. Madam Nyalungu’s popularity knows no bounds as many troop to her for spiritual fortification inside and outside that community. They believe she has been sent by some river gods in a far-away village to come and help the people in the city. Her duty, therefore, as a representative of the gods requires her to seek the intervention of the deities before healing any sick person. The reporter therefore sought her intervention in curing a fake psychiatric disease. Nyalungu was quick to point out that she could only cure the madness if directed to do so by the deities. After consulting them, she told the reporter and his group of friends who played the role of relatives that the gods accepted to help and had directed her on what to do. She brought two sets of concoctions and said the ‘gods’ had instructed her that, one be burnt and the fumes inhaled by the reporter and the other to be pushed into the nostrils and forcibly inhaled as well. She then started burning the unknown substance into flames in her traditional pot. Later she put off the fire leaving thick fumes emanating from the substance. She then asked the reporter to kneel down with nose directly facing the direction of the fumes, whilst she covered him with a thick blanket. The smoke went straight into my eyes and nostrils resulting in a sharp pain in my head and then at a point i started suffocating. Then I started coughing, with my nose running and my eyes watery; I simply could not open them because of the pain. Suddenly, I started vomiting and this time around, I had to terminate the process when the pain became unbearable. After several bouts, Nyalungu then pushed a substance into my nostrils and this also resulted in instant continuous sneezing, forcing watery substance from my eyes, nose and mouth again. ‘This is just the beginning’ she said adding that I have to come again and again. After the process Nyalungu requested for money to appease the deities, adding that, anytime we came for a review it was going to attract another fee; this time even higher. Dr. Sharp is the General Overseer of Yesu Nti Prophetic Church. He is a one-manned Church pastor who claims to have the powers to cure all forms of diseases including mental illness, AIDS and leprosy in a split second. With a congregation numbering less than fifty (50), Dr. Sharp’s church and healing centre is located within the heart of Ghana’s capital city of Accra. On a visit to this healing centre, one is greeted with the sight of patients suffering from a myriad of diseases in queue for their healing. Here, loud music, accompanied with drumming by two teenagers remains the stock in trade of Dr. Sharp. Despite many reports and accusations of fake healing against this self-styled healer, he steadily persists in his miraculous acts of healing. His claim to fame is his having a direct hand in praying for the current President to win the last elections. He therefore keeps a calendar with the presidents’ picture to colour his story. For him, the cure for madness is buried in his brand of anointing oil, three red candles and a specified amount of money demanded by the angels of God. When the reporter visited this healing centre, Dr. Sharp demanded GH¢80 for healing, an amount he eventually reduced to GH¢30 for the whole deal. After requesting for a full day of prayer for the reporter, Dr. Sharp said the angels had come to him and requested that reporter fasts for five (5) days. He gave strict instructions that the reporter rubs his brand of oil on the forehead every morning during the five (5) days of dry fasting. When the reporter returned after the five days with complaints of no change in status, Dr. Sharp simply shouted “The Lord is still God. The problem is that you did not fast well”. Dressed in all white Islamic robes with turban to match, Mallam Misky, holding the Quran and tasbi professes that he is Allah’s chosen one. He does not only communicate with angels but also dwarfs who he says have endowed him with healing powers and the power to conjure material things in the name of Allah, the most gracious and most merciful. Misky is a well-respected Mallam from Tamale in the northern part of Ghana with great ancestral roots. He has two houses in Tamale and another two built in Kasoa in the Central region of Ghana, he got them from being a powerful Imam, he said. When I told him I was suffering from madness, he was quick to say that his dwarfs had already told him of the problem adding that he had the capacity to cure it within a split second. Mallam Misky said he had helped cocaine dealers and other big personalities in the country. He said he needed to pay people to walk naked in the bush to cut the bark of a tree to cure the psychiatric illness and that the dwarfs who would be in charge of the healing process had instructed him to charge 5000 dollars before he does the healing. When the conversation was getting interesting I lied to him that I was a cocaine dealer. “I knew it, the dwarfs have whispered that to me already” he submitted. He then promised to change my cocaine into a substance that cannot be seen at the airport by security agencies so that I can safely smuggle them out of the country. Seidu Nagrengo a spiritual healer at Nagrengo, Burkina Faso was one of the healers of mental illness whom the reporter visited. In a very confident posture, this traditional healer’s Assistant told the reporter about revelations from his gods that the reporter has been bewitched. According to him, the reporter was suffering from severe mental illness caused by spiritual forces, one that can only be averted with the avoidance of meat, salt and pepper. He stressed on strict adherence to the rules, which he claims remained the only way the spirits would go away. At this healing centre, a lot of patients allegedly suffering mental disorders were seen chained and tied to logs and trees. Professor Chris Ndende, a clinical psychologist, who spoke to The New Crusading Guide on this story, could not hide his outrage, “With such an abundance of gullible worshipers, patients and believers, is it any surprise that these men and women of disrepute continue to ply their trade successfully to the detriment of patients across Africa? This in itself is not surprising considering the acute dearth of professionals specialized in psychiatry and mental illness”.